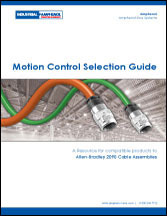 the Motion Control Selection Guide. A resource for compatible products to Allen Bradley 2090 Cable Assemblies. Amphenol’s combined motor power supply, brake and digital feedback cables, specifically for servo motors with Hiperface DSL® interface, achieve the highest standards within a single cable technology. These 2090 Series C-track compatible cables are designed with high active and passive interference resistance capabilities especially suited for industrial environments requiring low capacitance to maximize system power density.